The Kings Arms- My Kind Of Pub! Pulling up outside The Kings Arms in Pentyrch, I remembered how much I loved it the last time I went. It was for a summer BBQ and I fell in love with this beautiful country pub then. With its welcoming exterior, low doors that make me feel like I need to duck even though I’m only 5 foot 3 and a roaring fire, this grade II listed building is my idea of pub heaven. It has that country pub vibe and on a cold December night, I couldn’t think of anywhere I’d rather be. Inside is so cosy. The word rustic comes to mind but it doesn’t really do it justice because everyone is doing ‘rustic’ these days. The difference is this really IS rustic. 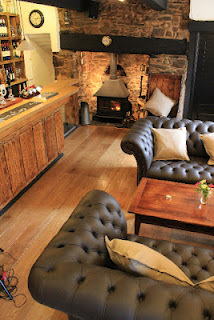 It’s not pretend, it’s not pretentious, it’s cosy country pub with rustic charm. That fact that it’s Christmas and there were white lights adorning the dining room only added to the homely feel. The stone walls and large wooden beams combined with the twinkling lights and faint Christmas music made me feel quite festive. Although I love to be at home at Christmas with a home cooked meal, if I was going to go out for dinner, it would be here. We had been invited to sample the Christmas menu. After a few Christmas meals already, I was very pleased to see that this menu had some non turkey options. For starters we were a bit torn but we settled for the carpaccio of Welsh beef fillet with watercress and pickled girolle mushrooms and the Arancini which in this case was deep-fried Hafod cheese and parsley risotto balls served with red chilli creme fraiche. The Arancini was very nice. The flavours were subtle but they were well cooked and nicely presented. The red chilli creme fraiche was delicious and worked well to moisten the dish. The carpaccio came as a generous portion, seasoned with sea salt which gave it a nice texture. The addition of the pickled mushroom wasn’t quite to my taste because the dish also come with a balsamic dressing which made it all a little too acidic. It was still very nice though and we happily polished off the plate. Moving onto the mains, we knew exactly which two dishes we wanted, the question was, who had what. In the end, as it was a cold wet night and I needed warming up, I went for the roasted silverside of Breconshire beef with yorkshire pudding and horseradish sauce and Mr V had the pan-fried salmon with cockles and laverbread butter, wilted baby gem and truffle mash. I was very pleased with my choice. My beef was tender, the roast potatoes were crispy and the yorkshire pudding homemade. The dish was served with some delightful parsnip crisps and seasonal vegetables. After tasting this, I will most certainly be going back for a Sunday roast. Mr V’s salmon was again delicious. The salmon was moist and well seasoned and a perfect partner to the salty and buttery cockles. The mash had a powerful taste of truffle which we both really enjoyed and it worked well with the other flavours of the dish. The wilted gem lettuce was an unusual but welcome addition. Full from the very generous portions, we had a break before dessert. Stuck between two, we had both and shared. We chose a lemon and lime tartlet with clotted cream and chocolate coulis and a chestnut and whisky cheesecake with crystallised ginger and vanilla syrup. The flavours in the cheesecake were very subtle and although beautifully presented with mint and berry’s I think it needed something more. The tart however was packed with flavour. I loved the bitterness of the lemon and lime combined with the chocolate and the cream. The filling was a little runny but it still tasted great. 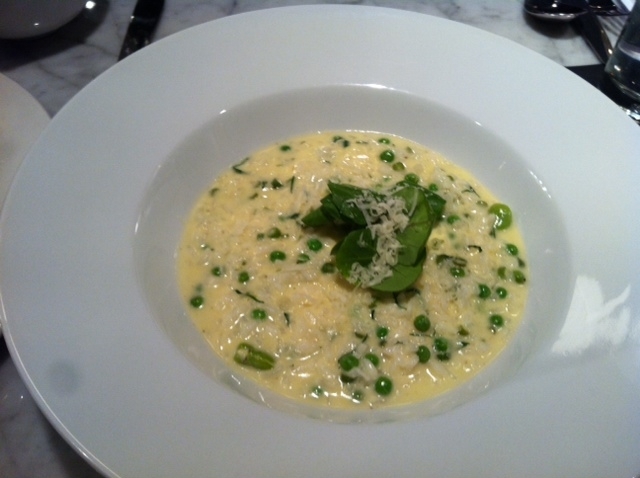 The lovely setting, faultless service and great homely food make The Kings Arms a hit with me. 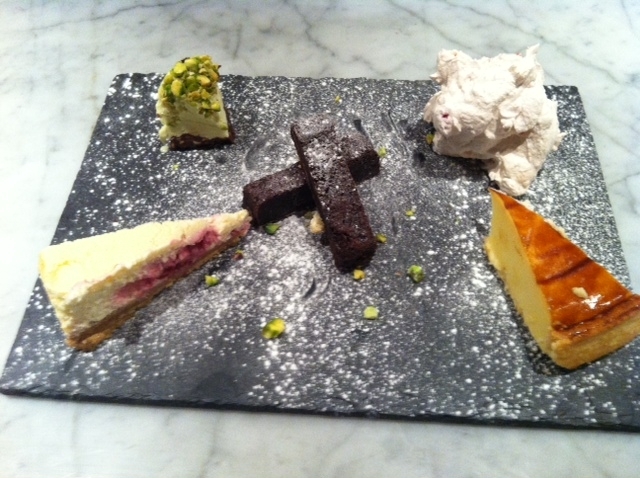 The Christmas menu was £22 for three courses and the evening menu looked just as good. As it’s owned by Otley Brewing Company, it meant that we could also have Otley beer with our meal which pleased Mr V who rounded his meal off with a pint of O Ho HO. The Kings Arms has just opened in Pentyrch. The Brains owned newly restored grade II listed building is being run by The Otley Brewery Company and is serving up some good food and their own award winning beers. We were invited along for the launch to try some of the beers on offer and for a BBQ as the start of the weekend’s Beer Festival. 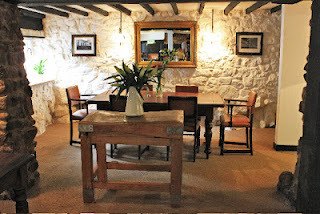 The cosy welcoming pub is very attractive from the outside and this continues as you enter. With many original features, a roaring fire and simple but stylish furniture, the 1700 pub has been brought up to date and looks the part. The menu looks great and where possible the ingredients are sourced locally. The Kings Arms is very much along the same lines as Nick Otley’s thriving pub, The Bunch of Grapes in Pontypridd. I’ll confess I’m not a beer drinker but I did enjoy some of the beers we sampled. I found the Otley’s Thai-Bo, made with the same spices you would find in a Thai green curry a very interesting concept and very enjoyable. There were also some beers from Brains to sample including one named All at Sea from their new craft brewery. On the food side, the BBQ was excellent with a choice of lamb stuffed with black pudding and rosemary, pork, poussin, steak, red snapper, mackerel to name just a few. I think that a partnership between Brains and Otley can only be a good thing and I wish them every success on their venture. I am looking forward to visiting again and sampling some food from the menu. Recipe for the highly acclaimed Wye Valley Pie! The Goat Major’s Wye Valley Pie won top honour at the British Pie Week awards in 2010. Described as “heaven in a pie” by judges, the pie is combines locally sourced buttered chicken, asparagus and new potatoes, topped with a layer of Tintern Abbey cheese and puff pastry. The Goat Major has become famed for its pies and now offers a pie only menu. The daily changing menu includes mutton and rosemary pie, butternut squash, spinach and goat’s cheese pie, and rabbit pot pie. And on the bar there’s a great range of real ales to match your pie. Heat 1tbsp of the olive oil in a heavy-bottomed, large sauté pan. Tip in the sliced leek and gently fry until just soft. Using a slotted spoon, remove the leeks and set aside. Pour the rest of the oil into the pan. Add the chicken and fry over a medium-high heat for 2-3 minutes to seal all sides. Drop in the potatoes and fry for 2 minutes, stirring occasionally. With the heat still high, pour in 450ml of the stock with the thyme, stirring to scrape up any sticky bits on the bottom of the pan. Lower the heat slightly, then lightly boil, uncovered, for 10 – 15 minutes or until the potatoes are tender. Meanwhile, lightly blanch the asparagus in boiling water for 2-3 minutes, drain, reserve 12 of the tips and chop the rest along with the stalks. Slacken the cornflour with 1tbsp of water. Stir this into the pan and cook, stirring, for 1-2 minutes to thicken. Stir in the reserved leeks, the chopped asparagus, crème fraîche and some pepper to season. You may not need salt. If more sauciness is needed, stir in the rest of the stock. Leave to cool. Preheat the oven to 220℃, (200℃ for fan assisted), Gas Mark 7. Press the strips of pastry on the rims, brush with water, then lay the lids over the top. Pinch the edges well to seal. Score lines across the top of each lid and make a small hole in the corner of each pie (or in each corner of the pie if making a large one). Brush the pastry with milk. Place the dishes (or dish) on a baking tray and bake for 15-25 minutes, depending on the size, or until the pastry is risen and golden and the filling is bubbling. Just before the pies are done, re-heat the asparagus tips in boiling water. Place them in the pie holes to serve. A bite to eat with the Brains ladies! A few weeks ago, I was invited to meet the marketing and PR ladies from Brains for a bite to eat in their new town centre establishment, Greenwood and Brown. I was unfortunate enough to miss the grand opening so I was pleased to get a second chance and an opportunity to sample some of the food on offer. I was very impressed when I walked in. It was nothing like I was expecting and if I hadn’t been told it was a Brains establishment, I would never have guessed. The layout was very up market and much more like a restaurant than a pub. In fact, although you can go in for a drink, they don’t serve beer on tap, only in bottles. It is much more geared towards eating than drinking. The Brains ladies busied themselves ordering lots of food from the menu for us to try which I am certainly not going to complain about! They were very passionate about the concept they were trying to achieve and keen to show off the menu which is currently unique to the Greenwood and Brown. I learnt a lot about Brains in those few hours (and ate a lot!). They are really trying to make more of the food they offer. While many Brains pubs will stay geared towards drinkers, others are being used to showcase the ever expanding and improving menu that development chefs are working on. Many Brains establishments use the same menus which they are able to select dishes from but some of the more ‘foodie’ places like the Greenwood and Brown have a menu developed especially for them which I was very interested to learn. I have to say the food was good and it is competitive. With a lunch menu at a fixed price of £7 and a general menu too ranging from £2.25 for bar snacks to £19 for a steak, there is lots to choose from. 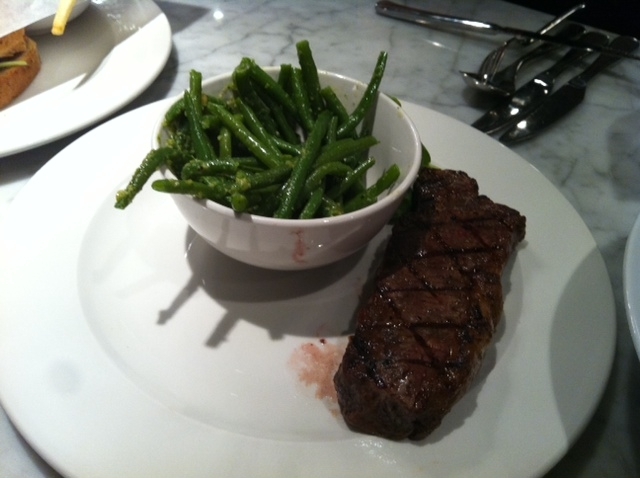 There are also daily steak specials and all ingredients are locally sourced where possible. We tucked into sandwiches, steak, risotto, mussels, chips, pork scratchings, and olives. Just as I thought I couldn’t possibly eat any more, dessert was ordered. We had what is called a ‘dollar dessert’ which meant we had a pounds worth of each dessert usually priced at around £5 for a whole one. I think it’s a brilliant concept and we certainly got a fair amount for the money. It looked great too. Until my meeting with the Brains ladies, I have to say, I never would have been that quick to pair Brains with good food. Many of the Brains pubs I have visited have been great for a drink but left me a little disappointed on the food front. Is this all about to change? With lots of refurbs going on, are Brains going to be able to make enough of their food to put them up there with some of the better restaurants in Cardiff. I’d certainly be more than happy to review some to find out. What do you think? I’d be interested to know your opinions on this…. FREE MEAL at the Greenwood and Brown! Greenwood & Brown is due to open at the beginning of December. Sign up for the chance to be invited to their complementary preview! The preview will give you the chance to experience the brand new Greenwood & Brown before anyone else, as well as sampling their brand new menu on the house.